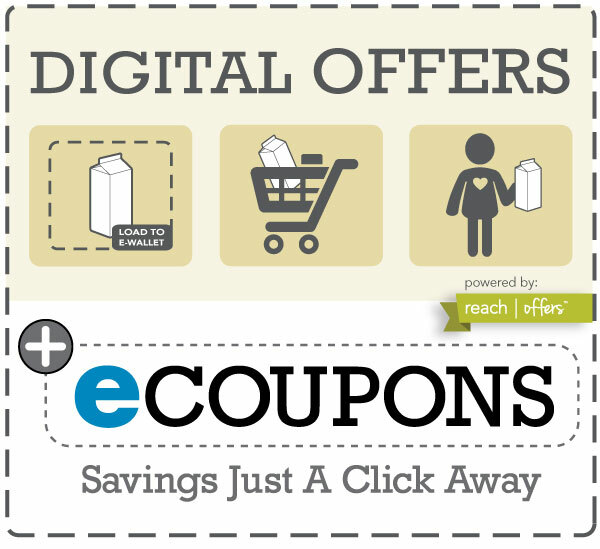 Digital Coupon Savings Are Just A Click Away! Select your products & present your phone number at check out. e-coupons will be automatically deducted from your purchase subtotal. It is a virtual account that holds all of your digital coupons and discounts, and is associated with the phone number [Shopper ID] that you used during registration. How do I create an E-Wallet? Visit https://gohugos.reachoffers.com to create an account. What information is needed to create an E-Wallet? What are the benefits of using my Shopper ID at checkout? To redeem coupons in your E-Wallet. In addition, when you enter your Shopper ID at checkout, the program learns what items you like to buy, your brand & product preferences and what digital coupons are meaningful to you. The more you enter your Shopper ID – the more personalized your digital coupons email will become! How do I save a digital coupon to my E-Wallet? To save a digital coupon to your account, click ‘+ Add’ on the digital coupon and it will be saved to your account. It will then be available for you to use the next time you checkout. Do I have to wait before the digital coupon is available? No. Digital coupons are available for use the instant you load them to your E-Wallet! Is there a limit on the number of digital coupons I can load to my E-Wallet? How do I know when the digital coupon has been redeemed? Your savings will be itemized on your receipt. The digital coupon will no longer be available in your E-Wallet and will be moved to ‘REDEEMED’ in your account. Yes. Expiration dates appear on each digital coupon. Expired digital coupons will be deleted from your account automatically. Are digital coupons available at all stores and locations? This program is exclusive to Hugo’s and cannot be redeemed at other retailers. If you forgot or need to change your password, click on ‘Forgot Password’ on the main login page. Enter the registered email address and follow the instructions to set a new password. How often will there be new digital coupons available? Shoppers will be emailed every week with new offers. The landing page will also be updated weekly. Can I use a digital coupon and a paper coupon for the same item? Most savings are limited to one coupon of any type (digital OR paper) per item purchased. Can I delete digital coupons from my E-Wallet? No. However, if you do not purchase the item(s) then the digital coupon will disappear at expiration. The phone number associated with an account is the PERMANENT identifier for redeeming digital coupons and cannot be changed through the shopper profile page. Yes. Shopper information is used solely for the purpose of the program and not shared with 3rd parties. What is reach | offers? A branded name for the real time redemption and load to E-Wallet technology coupled with the personalization of offers for each shopper’s email. What do I do if an digital coupon does not redeem at the register? Please see the Customer Service desk for any issues. If I return an item for which I received a discount, can I reuse my digital coupon the next time I shop? No. Once a digital coupon has been redeemed, it cannot be used again. If my transaction is voided after the Shopper ID is entered, will the digital coupon still be available for me to use? Yes. As long as the transaction has not been finalized, you can use the digital coupon in a future shopping trip. Do I have to print digital coupons? No. You must load the digital coupons to your E-Wallet to redeem. Printing or showing coupons on your mobile device will not be accepted. Why can’t I select ALL digital coupons? Manufacturers want shoppers to select the digital coupons they intend to use as some offers are limited.